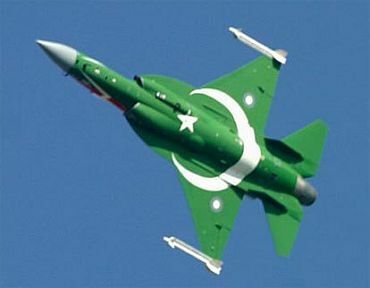 Pakistani combat jets pounded militant bases in the lawless North Waziristan tribal region, including the home of Taliban commander Adnan Rashid, and killed 25 terrorists in retaliation for a string of attacks on security forces. Military sources said the house of Rashid, a former air force technician sentenced to death for a 2003 attempt on the life of former dictator Pervez Musharraf, was targeted in the air strikes. Though some news channels reported Rashid was killed with some members of his family, the military sources said this could not be confirmed. Rashid escaped with scores of hardened militants during a daring jailbreak engineered by the Pakistani Taliban in the north-western city of Bannu in April 2012. "On the basis of confirmed intelligence reports about the presence of militants, their hideouts were targeted by air strikes last night in North Waziristan Agency. Twenty-five terrorists were killed," a military source said. The source claimed those killed included terrorists linked to attacks on a church and Qissa Khwani Bazar in Peshawar as well as a bombing within Bannu cantonment on Sunday that killed 26 troops. "Scores of militants were injured in these strikes," the source said. Unconfirmed reports said civilians were also killed in the air strikes. The casualties could not be independently verified as journalists are barred from the tribal belt. Army chief General Raheel Sharif visited Bannu and met victims of the bomb attack at a military hospital. The operation by air force jets took many by surprise. This was the first time the air force resorted to air strikes in North Waziristan since a ceasefire was finalised with local Taliban chiefs in 2007.